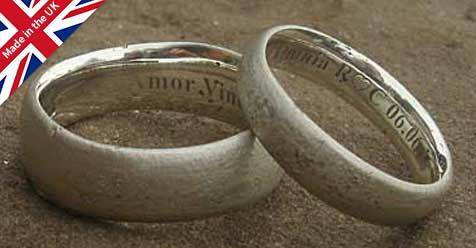 SILVER RINGS : BRITISH Made : LOVE2HAVE in the UK! The BEST! 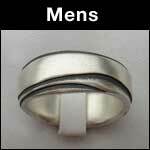 UK made silver rings for men and women. Silver is by far the most versatile of all the precious metal jewellery we sell. Silver can be stretched, cast, distorted, engineered, sculpted, beaten, hammered and even oxidised to create just about any design imaginable. It is with these fantastic options to work with that our designers create these unusual and unique silver rings all in sterling silver. We can help you find your perfect silver ring as this section is divided into two categories, being men's silver rings and women's silver rings, for your online shopping convenience, but many of the styles in both of these sections are suitable for both him and her. With this in mind though, we also have plenty more silver rings to choose from with the silver wedding rings found in the wedding rings category of our website. Silver is still the second most popular choice after titanium on our website, not least because of its good looks, but also because there is so much silver jewellery to choose from, especially rings. These rings are very popular particularly with young people who often wear several rings at a time on different fingers. The styles are limitless, as are the designs. There are some great heavy, chunky urban designs in the section for men with many different textures and finishes. From highly polished, to hammered, etched or engraved, men love these styles. Oxidised silver is also trendy for that more Gothic look and a firm favourite with the Rockers and Heavy Metal fans. All the silver rings come handmade from the finest sterling silver, both contemporary and urban in design, they make the perfect gift for him or her. Do remember though that silver is a relatively soft metal and pure silver is too soft for jewellery, so other metals are added to the silver to strengthen it up. In the UK 925 sterling silver is the standard and also the very best choice too as it used for silver jewellery pretty much everywhere. 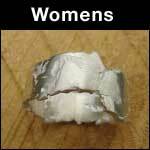 You can read more about our silver in the articles section of this website. On a final note we are very confident in that not only do we provide the BEST silver rings made here in the UK (and probably the world) but also at the LOWEST PRICES too. If you think you may have seen the same silver ring elsewhere at a lower price, let us know, and we will price match like for like. YES! We can BEAT anyone!